Tom's newest CD (released Oct '07). All songs written by Tom Todd. All instruments played by Tom. 1. APRIL An up tempo pop tune about a guy who has to travel far from home to pursue his music, but wishes he was back home with his girl. Features nice double lead guitar work and vocal harmonies. 2. FIRST IMPRESSION A soft mellow song about meeting that special person for the first time, and the rush of emotions that one experiences. Tom plays piano and sings harmony with himself. 3. SHOW OFF A driving, boogie beat propels this number about that person who drives everyone nuts because he's such a show off. Perhaps this song is a little autobiographical, because Tom shows off his talents on electric guitar, sax, flute, trombone and trumpet. 4. Planet X A fun, cute song about the best place to go to have fun! Astronomers please note the references to the planets, including Pluto (yes, it's still a planet!) and Xena. 5. SEE THROUGH THE SURFACE A very beautiful, sensitive and thought provoking piece dealing with any person's outer appearance vs their inner beauty. "If God made us blind, then we could SEE THROUGH THE SURFACE." 6. MR. COOL A very tongue-in-pierced-cheek look at the styles people come up with, and an especially shallow guy it seems we all knew at one time or another. 7. WHY DON'T YOU GO When you know that the relationship is simply not going to work anymore. 8. HOUSE AIN'T A HOUSE Metaphorically compares the shaping of one's life to the building of a house. Cool slide guitar, harmonica and bass guitar work. 9. GALE ON THE HORIZON Tom tries to capture what must be going through a sailor's mind when he realizes he's caught out on the open water in a bad storm, and may not live to tell the tale himself. 10. WALK ON WITH ME A happy love song. Life will be full of questions and surprises, but I can handle it all it you're by my side. Nice acoustic guitar work. 11. NOVEMBER A sad month, and a sad time of year as the life and beauty of summer dies. For a person who has lost a lover, it's even more poignant. There you have it, from April to November, every song is interesting, entertaining and beautiful in its own way. A Summary of all the songs: Song #1 is an original Christmas love song. Songs #2 - #7 are traditional, well-known Christmas songs. Songs #8 - #10 are Christmas - comedy songs. 1. 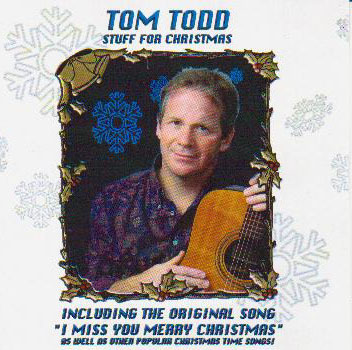 I MISS YOU MERRY CHRISTMAS written by Tom Todd. First of all, an interesting play on words, using "MISS YOU" instead of "WISH YOU", in the title. Second, the songs deals with spending Christmases away from a loved one. The joy of the holiday seemed to make the melancholy of being apart even more intense. In my song, it's up to the listener to decide if the girl is just away temporarily, or if she has left this poor guy for good. Finally, the melody is very pretty, if sad. The song is immensely enjoyable. 8. THE SINGING SANTA - RUDOLPH Funny - This mall Santa faces off against the worst, nastiest, most sugared-up kids in town! 9. I'M GETTING NUTTIN' FOR CHRISTMAS Funny - This cute popular ditty is a favorite among kids and anyone who ever had kids! 10. CHRISTMAS OLYMPICS - 12 DAYS Funny - After singing this song 8,000 times himself, Tom wondered how fast it could actually be done, and if there was a world record. It only followed that there should be an Olympic event for this song. Instruments featured: acoustic and electric guitars, keyboards, drums, soprano and alto saxophones, flute, recorder, bass. 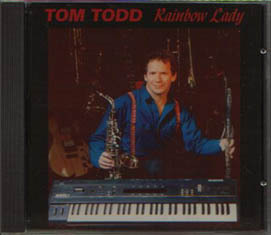 Tom's first CD, with 18 original songs, it features a nice variety of rock, folk rock, and love songs. Innovative melodies and chord structures, words with meaning, and a variety of musical instruments make this a very pleasing and interesting album. While his main instrument is the guitar (accoustic or electric), he does some fine flute and saxophone work on the recordings, too. All instruments [keyboards, drums, bass, sax, flute, guitars] are played by Tom. All songs written and recorded by him, also. Julie Slattery is featured on vocals on the beautiful duet I THINK I'M IN LOVE, and on the rockin' T.J.'S BOOGIE and ALL OF MY LOVE. Probably the most requested song is SCOTCH ON THE ROCKS, a little bit Scottish and a little bit rock'n'roll.